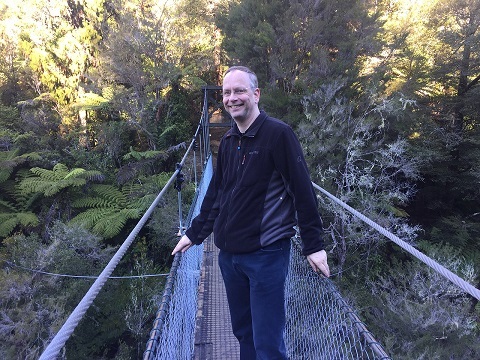 Visiting Erskine Fellow Professor Richard de Grijs arrived in April from Peking University, China and is visiting the Department of Physics and Astronomy. Where you have come from and what do you teach? For the past 7 1/2 years, I have been based at the Kavli Institute for Astronomy and Astrophysics, an international research institute at Peking University in Beijing, China. Originally, I am from the Netherlands, but as so often happens, a career in science has taken me across international borders a number of times, with postdoctoral positions in the United States and United Kingdom (UK), followed by a faculty position in the UK before being appointed to a professorship at Peking University. At UC, I teach a special topic at 300/400 level in the Department of Physics and Astronomy. In essence, I teach a slimmed down version of a course I developed in Beijing on the basis of a high-level textbook I published in 2011, which focuses on the physics of a wide range of methods of distance determination in astronomy, from the nearest stars to the edge of the Universe. I had heard about this scheme from a former Erskine fellow, so when I ran into colleagues from UC at the 2015 International Astronomical Union’s General Assembly, which was held in Honolulu Hawaii that year, I took the opportunity to bring this up. Following some discussions, it appeared that my expertise and research interests matched well with those of the astronomers at UC. Visiting New Zealand had always been a strong desire, so I’m glad I had the opportunity to visit this wonderful country. I am particularly enjoying interactions with the students and staff, but more generally with Kiwis I meet anywhere, really. Everyone is so friendly! I hoped that we could establish scientific collaborations with local UC astronomers, and I’m pleased to say that a number of discussions about possibilities have been ongoing. The University’s Mt John Observatory at Lake Tekapo is of particular interest in this context; I have visited it twice already, but that was mostly for scientific tourism reasons. I hope to be able to use actual data from the observatory sometime soon though. The incredibly friendly Kiwis! Plus the interactions with colleagues, students, members of the Canterbury Astronomical Society where I gave a public lecture, etc. And the abundance of fresh air (remember, I am usually based in Beijing, where the air quality occasionally deteriorates to a level that prompts news reports around the world…. fortunately this doesn’t happen very frequently, but still). I also enjoy being able to indulge in food that is a bit more difficult to access in China, including cheese and liquorice! I have had the opportunity to visit friends elsewhere in New Zealand, and so I managed to see some of this beautiful country and experience their great hospitality. This definitely calls for more, and my wife (who couldn’t join me this time owing to her own busy schedule as an academic) is insisting that I take her to New Zealand for a vacation soon!